Rich chocolatey chips are melted with espresso and combined with our mocha infused steamed milk, then topped with mocha-espresso whipped cream and mocha-espresso drizzle. Like a Molten Chocolate Cake, it reaches new depths of chocolatey deliciousness. 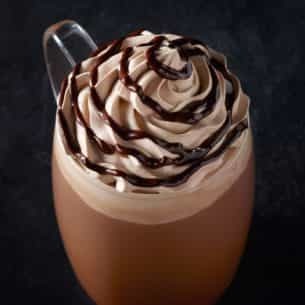 Milk, Mocha Sauce [Water, Sugar, Cocoa Processed With Alkali, Vanillin], Brewed Espresso, Chocolate Espresso Whipped Cream [Cream (Cream, Milk, Mono And Diglycerides, Carrageenan), Mocha Sauce (Water, Sugar, Cocoa Processed With Alkali, Vanillin), Brewed Decaf Espresso], Frappuccino Chips [Confectionery Coating (Sugar, Palm Kernel And Palm Oils, Cocoa Processed With Alkali, Soy Lecithin, Vanilla, Milk), Cocoa (Processed With Alkali, 9%), Cookie Crumbs (Unbleached Unenriched Wheat Flour, Sugar, Palm And Palm Kernel Oil, Cocoa Processed With Alkali, Chocolate Mass, Salt, Sodium Bicarbonate, Soy Lecithin, Natural Flavor), Chocolate Mass (2%), And Salt], Chocolate Espresso Drizzle [Mocha Sauce (Water, Sugar, Cocoa Processed With Alkali, Vanillin), Brewed Decaf Espresso].